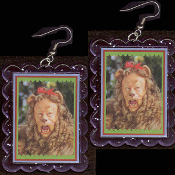 HUGE Wizard of Oz COWARDLY LION EARRINGS - Funky King of the Jungle Courage Novelty Movie Character Costume Jewelry - BIG clear purple glitter plastic frame toy Bert Lahr photo charms, approx 1-7/8-inch (4.69cm) tall x 1.5-inch (3.75cm) wide. Follow the Yellow Brick Road! Lions and Tigers and Bears. Oh, My!